My love affair with rasam started somewhat late in life. Unlike my siblings, as a child I preferred thicker soups, stews and curries eaten with rice. I always wrinkled my nose with apparent dislike at the very mention of its name. The thought of mixing it with rice, a custom akin to every South Indian, didn�™t go quite well with me. It so happened that rasam turned out to be one of Ro�™s favorites. A plateful of rice with hot and spicy rasam made him a happy man. With the help of my cousin Raksha, I sourced the eeya chombu (the vessel in which rasam is traditionally made, seen in the picture above) from Chennai. It was with firm ambition to make a nice pot of this south Indian staple that I ventured into the kitchen one day. I was greatly amused when I saw the man in my life, otherwise not a very big eater, devour the entire pot with great relish and gusto. It was at a traditional south Indian restaurant in Coimbatore that I first began to open up to this delicacy. I realized that a cup of rasam spiked with spices like pepper, cumin and red chillies with hints of coriander, tamarind and curry leaves, could fight a cold, serve as an appetizer in the beginning of a meal, tingle one�™s taste buds and warm one�™s heart. Its been a couple of years now, I no longer wrinkle my nose, nor do I make a separate dish for myself when this is going to be a part of the main course for lunch like I used to and even serve it with great enthusiasm to my family and friends. I even make the spicy mixture of Rasam powder, so integral to the flavour, aroma and taste of a well made Rasam and wonder about my childhood aversion! P.S.- I just got a note from my sister's father-in-law, (a staunch South Indian at heart) that says: "Iyya chombu should never be kept in the stove burner in “empty condition”. There should always be some content like oil; water or the spices should be there. Otherwise, whole chombu would become a molten metal within few minutes. Also, in the Iyya Chombu, the Iyyam content should be of the edible type. In fact, a good Iyya chombu would look like whitish silver in color and the not so good one will have black patches. This also needs to be taken care of while buying the chombu.These are some inputs from the little what I remember from my mother". The secret of a good Rasam lies in good quality ghee and rasam powder. Store bought rasam powder cannot match the robust flavours found in homemade spice blends. When the seasoning is poured into the boiling pot during the final stages of its preparation, a delightful hissing sound is produced. Enjoy rasam as a drink or relish with hot rice and a dollop of ghee with some crisp hot happalams or papads. Cook the dal with 1 tsp ghee, ¼ tsp turmeric and ¼ tsp asafetida with 1 cup water in a pressure cooker. Wash tamarind in many changes of water until clean, and bring to a boil with ½ cup water. To the cooked dal, add the strained tamarind mixture, Rasam powder, red chilli powder, pepper, curry leaves and 1 chopped tomato and bring to a boil. Put in 3 cups of water, chopped coriander, salt and boil again. In a small kadhai, heat the ghee or oil, put in the mustard seeds and when they splutter, stir in the hing. Pour in the seasoning to the boiling rasam, moving a few steps behind while doing so and switch off the flame. Serve hot as a drink or with plain boiled rice and a dollop of ghee. Nice one, I posted the same few days ago. Nothing can beat to spicy rasam, hot rice and ghee. Love all your photos :-). Visiting your site for the first time. You do take a lot of care in preparing your posts and recipes. Enjoyed a lot of them and special thanks for the Thai soup. Aru: Didnt know you had a food blog. Was pleasantly surprised to find it. Eroteme: Thanks for your visit and comment. 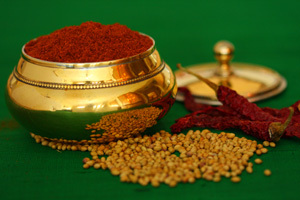 Will post my rasam powder recipe shortly in a separate post. Ah! My favorite! Not to forget the many varieties of the rasam!! I love it when garnished with grated coconut. Love your page, I'm a South African but a lot of the recipes that you post here are wonderfully familiar but at the same time very different to what I've grown up eating. 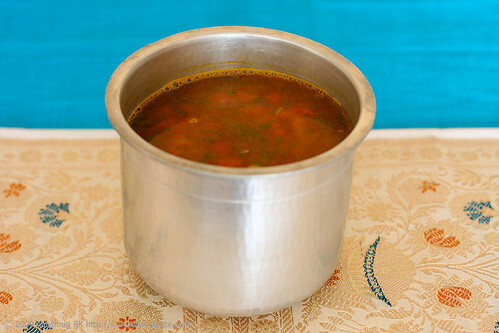 I love rasam, my granny has a very similiar recipe to the one you have posted but I don't think we this Iyya chombu, do you know what I could use in place of it? I didn't realise the vessel was so important. Thank you! SArisha: Nice to hear from you!I don't use my eeya chombu all the time. You can make rasam in a any pot and it will be delicious all the same. Thank you for the detailed step by step recipe. I tried it and the Rasam tasted super delicious. Mayur: I'm very happy to know that you liked the Rasam!